What only can be described as a provocative and visually stunning picture, director Ari Folman has created a genre of innovative and often devastating scenes in the recently released, ‘Waltz With Bashir’. Taking four years to complete, Waltz begins in 2006 with Ari meeting with a friend from the armed service period, who tells him of his recurring nightmare connected with his experiences from the 1982 Lebanon War. Folman is somewhat surprised that he cannot remember anything from this time. The conversation invokes a hallucinogenic flashback where Ari sees himself on the night of the massacre, a 19-year-old soldier emerging from the sea walking ashore underneath a flare-lit night sky. The reality of which, he is unable to explain. The film follows Ari in his conversations with friends, a psychologist and the famous reporter Ron Ben-Yishai who was in Beirut at the same time, intrigued by his riddle, in a search of self-discovery, trying to piece together the complex puzzle scattered in his mind. What was he involved in, or not involved in. He needs to discover the truth about that time and about himself. As Ari delves deeper and deeper into the mystery, his memory begins to creep up in surreal images. Folman’s new film belongs to a rare yet exceptional style of film known as the “animated documentary”. The first recognized example of this is Windsor McKay’s 1918 12-minute-long, ‘The Sinking of the Lusitania’. which uses animation to describe and show the sinking of the Lusitania after it was struck by German U-Boat torpedoes in 1915. To many, ‘Waltz With Bashir’ is how the recently released ‘Max Payne’ should have been shot, often delving into the surreal plains of film-noir, a style so relevant, it helps portray the confusion, flashback and uncertainty of the entire conflict so flawlessly. The animation style of the movie is a perfect tool to convey the tricks and survival mechanisms of the mind and memory, scening somewhat lurid, distorted and chemically enhanced colour schemes, adding to the already sombre tone of the conflict. One such scene, described by a character in the film as place “tripped out on LSD”, is so vivid and tangible, one can almost smell the decay and feel the anguish and confusion felt by the soldiers. The sky lit up in deep yellow, pulsating with the trees amidst the ruin. The film’s art director and illustrator, David Polonsky, has done a remarkable job. He lulls the viewer into a landscape where reality is wonky and woozy. From the interviews, the film frequently goes off into wonderful flights of fantasy and surrealism. The film takes its title from a definitive scene from the movie in which one of the interviewees, the commander of Folman’s infantry unit at the time of the film’s events, grabs a heavy machine gun and “dances an insane waltz” amid heavy enemy fire, between walls hung with posters of Bashir Geyamel. The 1982 massacres at Sabra and Shatila are a heavy imprint of horror and the destructive compulsions of the human nature, the horrors of war and the atrocities of which humans are capable. Waltz ends with a short segment of news archive footage of the grieving survivors, mothers and daughters mostly, shuffling through the streets, riddled with the bodies of loved ones. What we are left with is a harrowing, vivid and unique portrait of war, leaving the audience in a daze of awe. 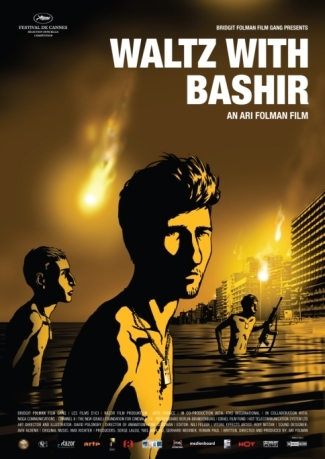 Posted in Entertainment, Uncategorized and tagged film, review, Waltz with Bashir. Bookmark the permalink. Was the Hurt Locker better than Avatar?